There are different possibility to use the UART under Interrupt, for instance use PRINTF but this mode use a loot of code or, more efficiency is to use the Call Back. In this example we use the Call Back modality. This project was tested on NUCLEO-F030R8, was developed using the Cube-MX and the project is for ATOLLIC. For use this project connect the NUCLEO-F030R8 to PC and use a terminal emulator, we suggest TeraTerm. This because the USART2 is transferred to the PC like a USB virtual com port. Here there is the Cube-MX project. 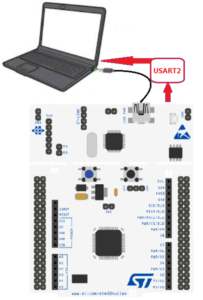 In this project we use only the USART2 because it is connected to the PC via the ST-LINK-v2 present on the NUCLEO-F030R8. 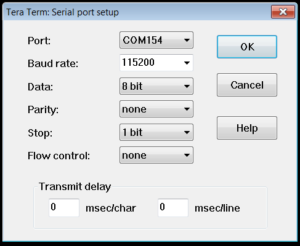 The USART1 is already configured for work under Interrupt but is not used. This project send a buffer (10 characters) via USART2 and receive a buffer (via USART2) from the PC (10 characters). 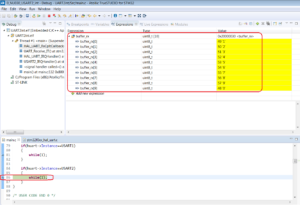 After the Cube-MX has generated the project, here there is the Cube-MX project, is necessary insert some lines of code for configura the call back and the USART. See below. see point 1 e 2 below. 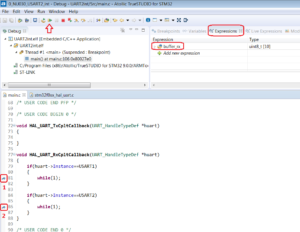 Run your code, see the red arrow below. 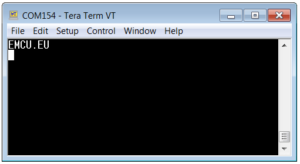 Open TeraTerm and configure it as shown below. Choose a right com port. Stop your program and restart it, on TeraTerm you must see something like below. The debug mast stop at line n.86 and in the variable buffer_rx must contain the characters that you typed in TeraTerm window. That is all, now try you to insert a similar action using USART1.